The Rodriguez family posted an update on baby Caleb's situation. In case you missed it, Caleb was born in early November to a missionary couple supported by the College Church of Christ in Fresno. Caleb's grandfather, Dan Rodriguez, grew up in Fresno at the College Church. I've posted about Caleb's situation several times. They are in a quandary as to what they need to do next. Should they go back to China? Should they stay in the U.S.? Caleb's full situation probably won't be known until he begins to develop more, but that could be many months down the road. Then they will be able to monitor his development to see what damage he may have received due to his condition at birth. They covet your prayers. 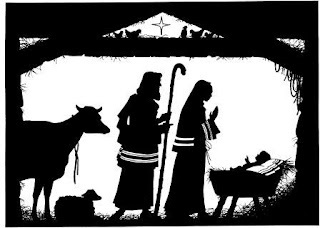 The following note was posted on Christmas day. Our family continues to be blessed by your constant prayers and loving support. We have been comforted knowing that you are with us throughout this difficult journey. Luke's gospel envisions the world of a vast empire. We might expect Luke, our narrator, to engage in schmaltzy flattery of the exalted emperor or gush about the enormity and dominion of the Roman kingdom. He introduces us to the great emperor, Augustus – also known as Octavius – and our minds might flash to the seat of splendor in Rome. If I were writing the movie script, I would flash to Caesar in his palace, signing a decree that all his subjects should be registered. Caesar would say, "I want to know the exact size of my empire." One of his minions would exclaim, "Yes, very good, my lord. Why, my lord?" And the emperor would reply with a scowl, "So you can calculate our tax revenue and so I can know how many men can fight in my armies." I don't know when or if they will receive some kind of definititive diagnosis about Caleb's condition. I have the latest news for you, this from Caleb's paternal grandparents. Caleb has been at Children’s Hospital of Los Angeles (CHLA) since Saturday, November 27th. Thankfully, Marcus and Julia have been blessed to be able to stay nearby at the Ronald McDonald House, allowing them to take turns watching Caleb day and night. They have also been blessed to have a few very special friends and family members stay with Caleb when they needed to catch up on their sleep. Here's the latest information on baby Caleb, as posted on their Caring Bridge account. Caleb is growing well at Los Angeles Children’s hospital since his Med-evac flight from across the world. He is now huge and fat! Marcus reports that he looks like a bouncer—no neck just a roll at his shoulders and then his head. I love a follow-up comment to yesterday's blog post. The story is different for California communities like Kettleman City -- major birth defects in that small town & the coincidence of a nearby toxic waste dump -- and Hinkley -- the town featured in the movie Erin Brockovich. In towns like those, you'd better be drinking bottled water! On a separate note, my doctoral thesis is almost done. Hallelujah. Just a few final touches. And then off to be slaughtered by the powers that be. But at least I'm that much closer. Glory! The environmental price of drinking bottled water is more than the plastic in the bottles. Another contributor to the cost is the transportation involved. If your bottle of water comes from Maine, that bottle has to travel across multiple state lines to get to you unless you live in New England. That requires interstate commerce for something you could have obtained by simply turning on the tap. An Italian grocery company has decided to start promoting local water over bottled water that must travel long distances. Their campaign is running into heavy resistance from the water companies -- because water is big business. Fiji water, for example, is the #1 industry in all of Fiji, and it just involves bottling water from Fiji and putting it on ships to sell in the US. On a whim, I just glanced at Mike Cope's blog. Yesterday, he posted a most fascinating video that I want to share. It's an amazing use of statistics. Bravo, Hans Rosling. And thanks! 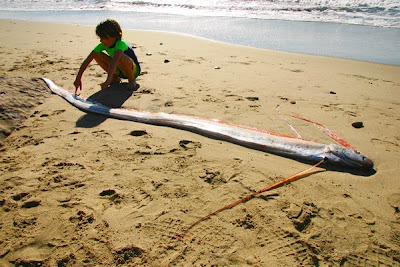 According to the article, "oarfish are largely a mystery to scientists, but they are typically found 700 to 3,000 feet beneath the surface in tropical and temperate waters, where they feed on small squid and krill." They can grow up to thirty feet long! For more on the story go this LA Times link.